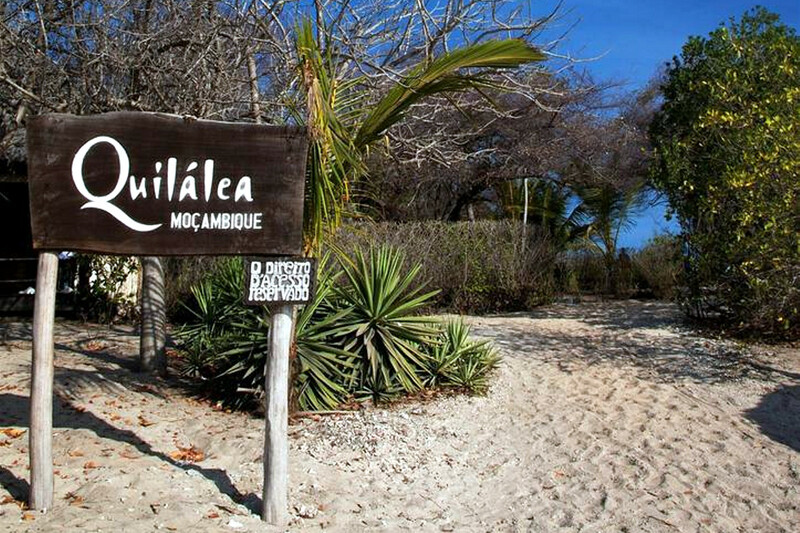 Turtle Beach is the most beautiful beach on Quilalea Private Island. We set off on an Island Baobab nature walk to explore the island’s indigenous vegetation, with statuesque age old baobab groves and stunning flora and fauna, it’s a real nature lover’s paradise. 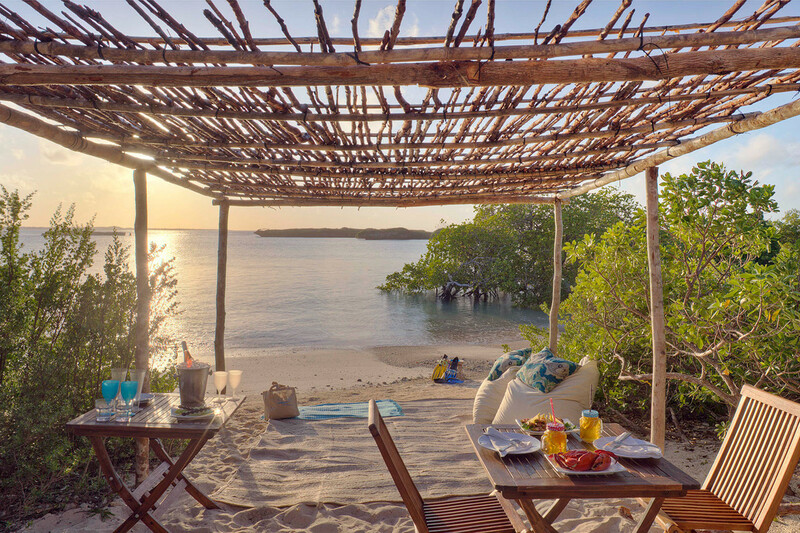 We will meander along the island's paths until we reach the stunning Turtle Beach, where we will host you to a special picnic (breakfast/lunch) and then leave you to enjoy a few lazy hours in the sun, with shade cover, cushions and beanbags provided for your comfort. 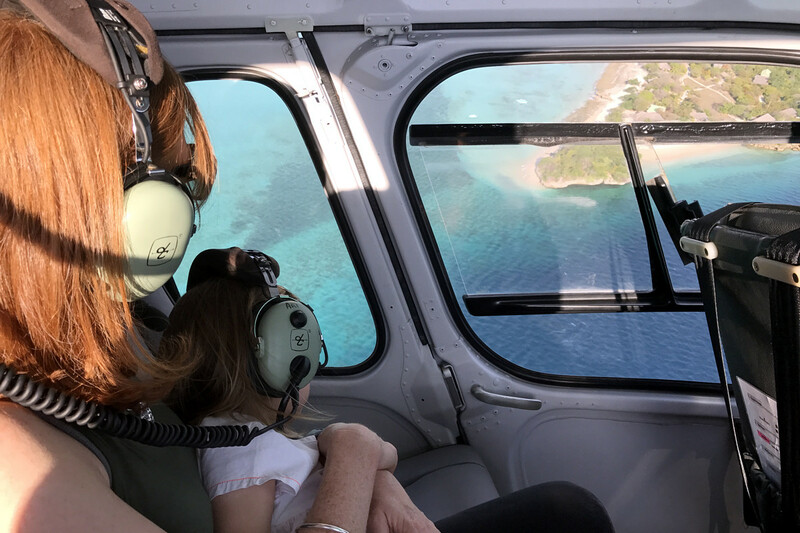 Enjoy an aerial view of the islands. Fly over the coconut plantation on Quirimbas Island or enjoy a view of Ibo Island from the air. The route will be planned according to the flying time requested and can be tailor made to suit your preference. Flying times may vary between fifteen and sixty minutes for up to four guests at a time. Departure dates and times will be confirmed accordingly. Join us for a 10 minute scenic trip by helicopter or a 40 minute boat ride to Ibo Island, the foremost heritage site in Northern Mozambique. Ibo is full of fascinating architecture, old ruins and lots of cultural history. 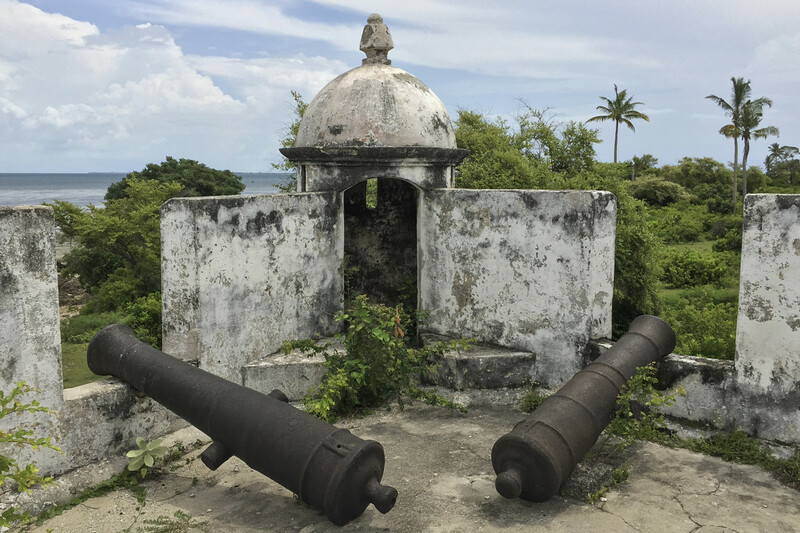 We will arrange a specialist guided tour of the island, with the chance to see the Silversmiths at work, the village and the famous pentagon shaped ruined old fort, before hopping back on the boat to enjoy a cruise back through the mangrove channel. The stunning house reef off the main beach is paradise for snorkelers, with easy access at all times of day. Take the plunge and you will see a colourful array of hard and soft corals, and a variety of reef fish, including parrot fish, schools of Bluefin kingfish and sweetlips. Snorkelling can be done at any time, but is best at low tide. Pop past the watersports centre to collect your snorkelling gear on arrival, and you are welcome to keep it with you throughout your stay. Please take care not to step on our precious corals, or take anything you may find on the reef. 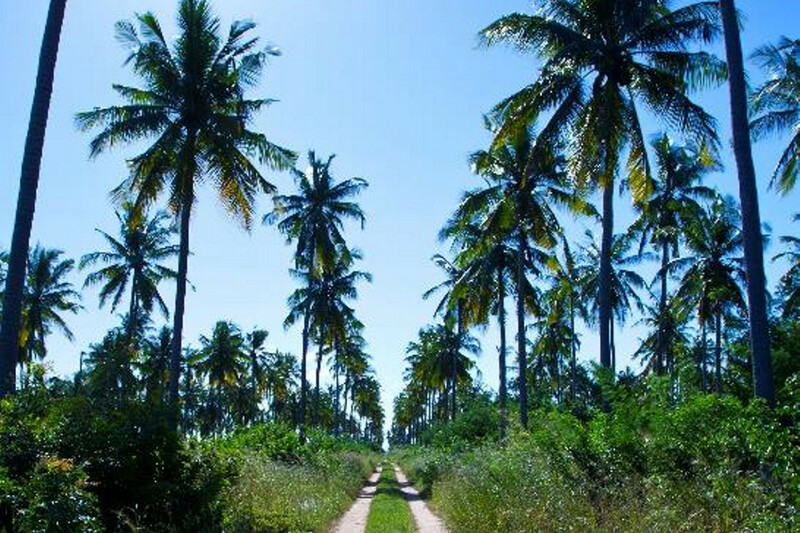 There is a marked walking trail around the island, a great way to learn about the wonderful environment we have here at Azura Quilalea Private Island, and to explore the island’s baobabs, birds, and butterflies. The circuit takes around 45 minutes, and begins adjacent to villa 5, or you can follow the walking feet signpost just off the pathway by villa 8. Remember to take some water along with you. The island is approximately 86 acres in size and apart from Azura staff and guests, it is completely uninhabited. 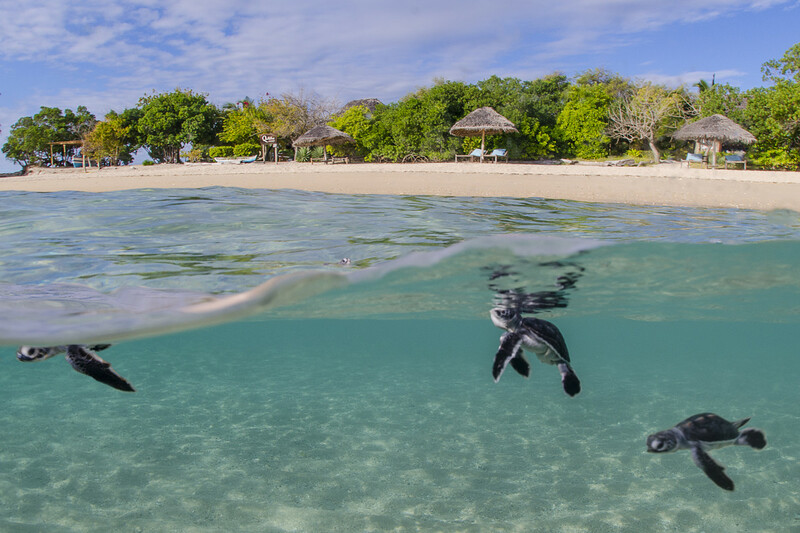 Studies by the WWF and other scientific bodies have shown that Quilalea Private Island is one of the most important nesting sites in the whole Quirimbas Archipelago for Green, Hawksbill and Leatherback Turtles. Our turtles nest from June to July each year, with the resulting hatchlings emerging for their dash to the seashore from August through until September. We monitor Turtle Beach for nesting turtles and hatchlings throughout the season, but sightings are most common at high tide, particularly at dawn or dusk, or during the night. 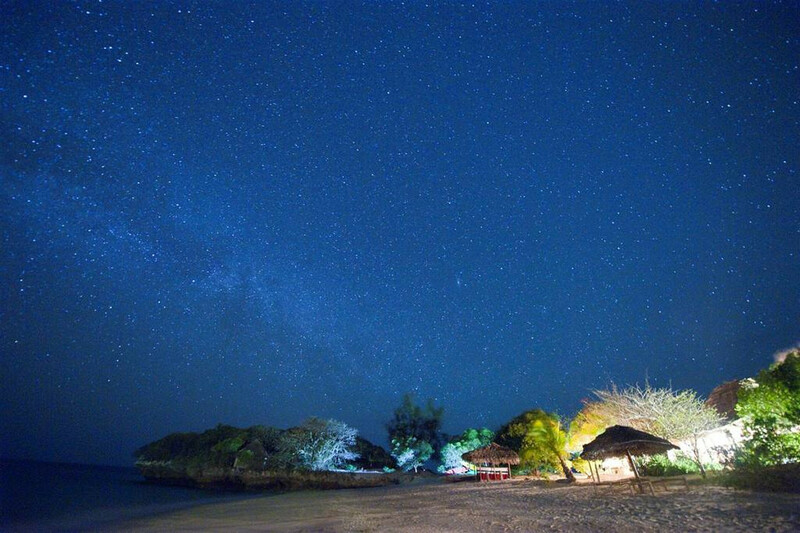 Quilalea Private Island is a nature lover’s paradise, with 58 giant baobabs thought to be between 1500 and 3000 years old, and a home to some 134 species of birds. 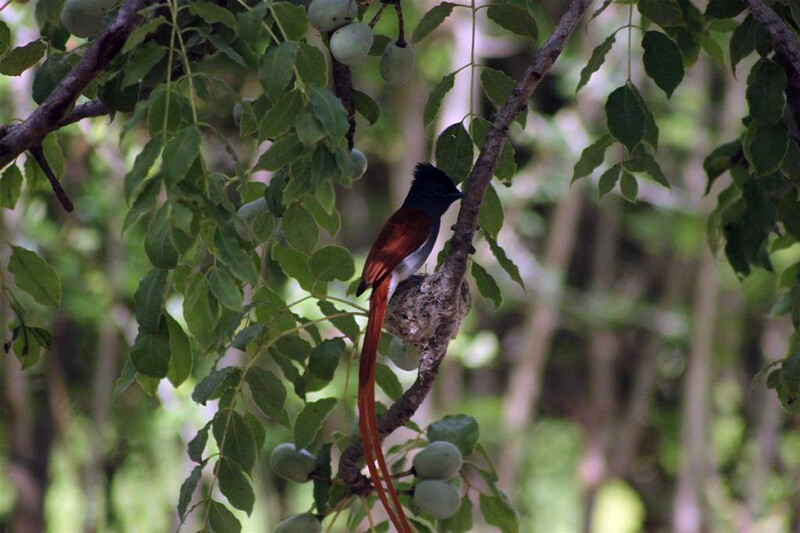 If you would like to learn more, go out on a guided nature walk with one of our guides, who will happily tell you all about our diverse bird life that include nesting Bee Eaters, Mangrove Kingfishers and the intricacies of the Giant Baobabs, as well as explain the uses of some trees and plants along the way. 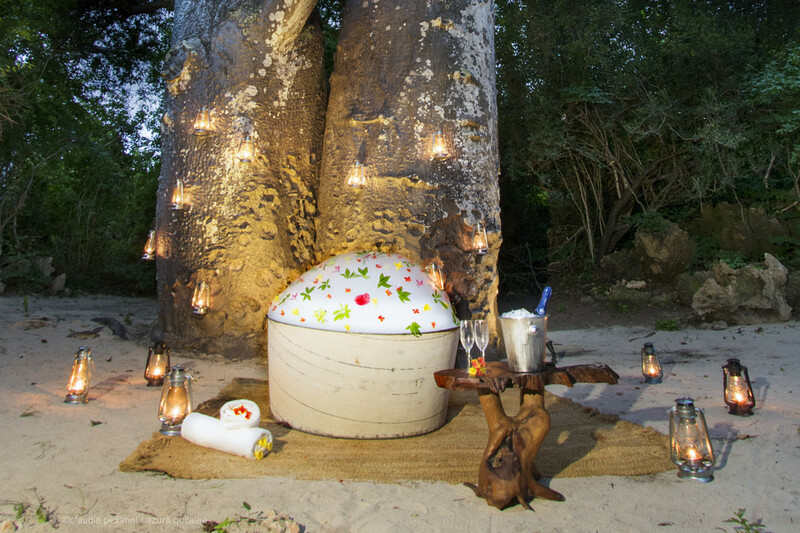 Experience the romance of bygone Africa with our unique Baobab Bath experience. We will bring a cast iron bathtub to your villa, and set up a special baobab bath for you to relax in with a glass of bubbly as the sun goes down, the moon rises and the stars come out above you. Perfect for celebrating a special occasion. A must for lovers of snorkelling, we guide you out onto the house reef with underwater torches to see how different everything looks at night, as the shrimp and a host of night critters and fish come out of hiding from their daytime slumber a whole new underwater world awaits you. Kindly note: All activities are subject to weather and tidal conditions. Join our Sky Guides for an informative presentation and discussion about the African night skies. Using our telescope, we will show you beautiful constellations such as Orion, Scorpio, Hydra, and the glittering Milky Way. Learn about astronomical phenomena, stellar events from Nebulas to Gas Clouds and Black Holes! We’ll even show you how to orientate direction from constellations such as Orion and the famed Southern Cross to locate North and South. Sky Guides are equipped with laser pointers reaching 1.5km into the skies, and an 8-inch reflecting telescope. A vast array of marine life thrives including tropical fish like Sweetlips, Angelfish, Triggerfish, Pufferfish amongst breath-taking coral reefs riddled with Lettuce coral, coral "Bommies" reef banks’ and soft sponges. 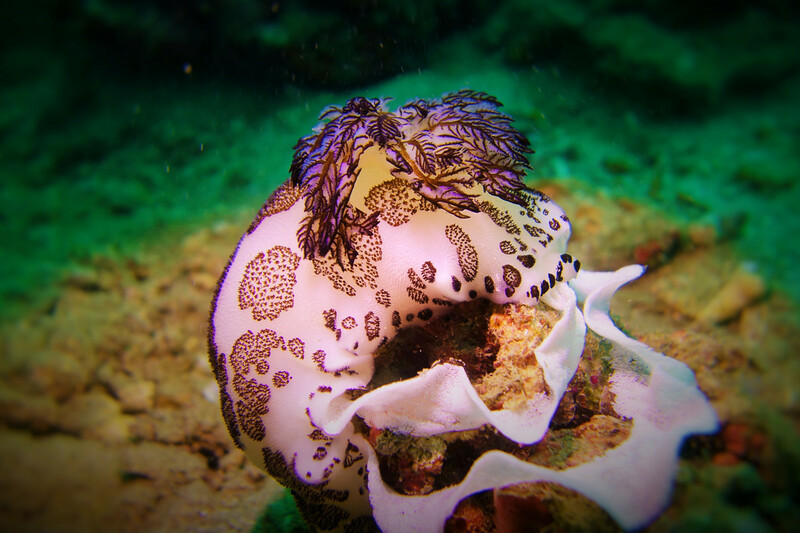 Other interesting sightings you may see include Clown Fish, Moray Eels, Stingrays, Sea Cucumbers, Starfish, Octopus, Groupers, schools of Kingfish, Snapper, Fusiliers, Salad Fish, Lion Fish, Nudibranchs and Macro Critters, Green and Hawksbill turtles. Our kayaks are available for your pleasure at any time, please ask at the watersports centre for paddles and safety equipment. Please let us know where you plan on kayaking and your expected return time, and be cautious of the strong currents we experience at certain times, as well as the wind direction if it is blowing offshore. 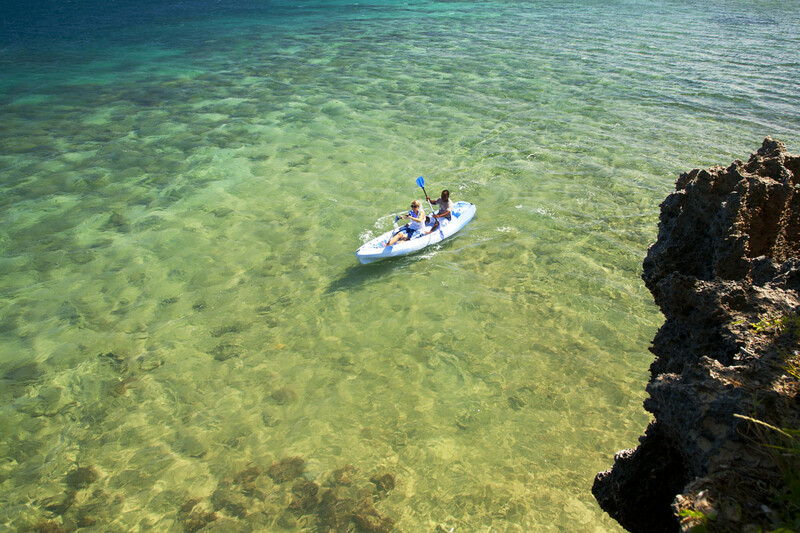 If you would prefer, one of our accomplished guides will accompany you on a kayaking safari, which is a great way to view the island. Trips to watch humpback whales are available in season (from July to October), if we are lucky we will see these beautiful animals breaching and lob tailing- sometimes they are even spotted swimming past in the deep waters just off from the beach. Dolphins can be spotted all year round. 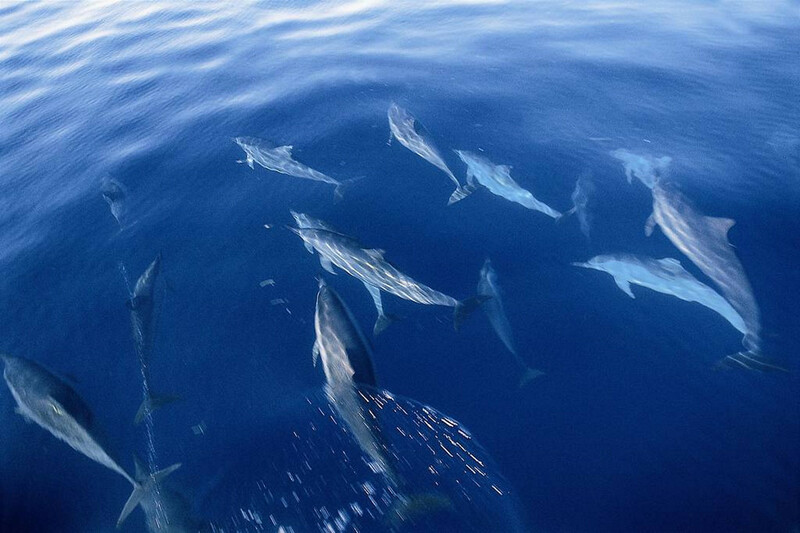 The site is known to be important nursery area for bottlenose and humpback dolphins. 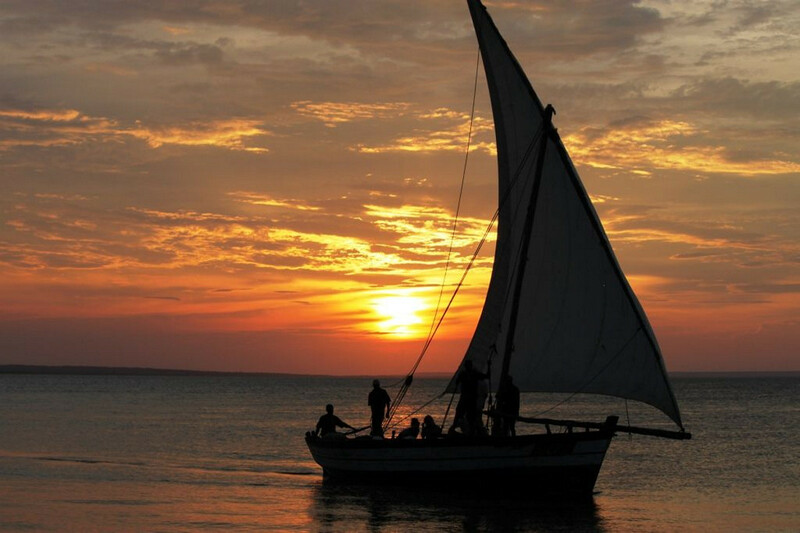 A time honoured tradition in East African waters, set sail in a traditional Mozambican Dhow sailboat, and watch the sunset as you drift along on the ocean breezes. Time stands still as you sail on a 40 foot traditional dhow as the sun goes down. We will provide drinks and snacks for you to enjoy along the way. 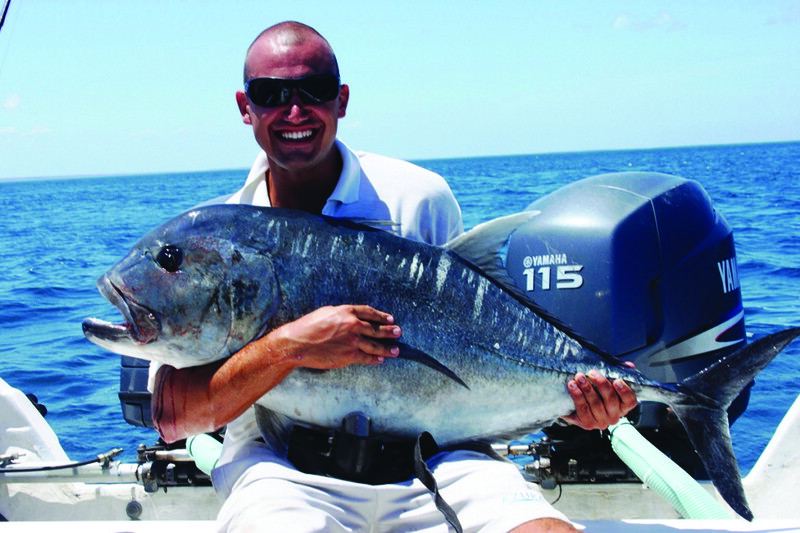 The oceans off Quilalea, with their spectacular drop offs and currents, offer some of the best big game, bill and saltwater fishing in the Indian Ocean. Species include: Sailfish, Tuna/Bonito, King/Queen Mackerel, Giant Trevally (GT’s), Prodigal Son, Wahoo, Dorado, and Barracuda. Our Watersports Centre has a range of professional tackle for both the beginner and the enthusiast. We will happily cook your catch of the day for lunch or dinner, but we operate a strict catch and release policy on protected species. The protected reefs in the Quirimbas Archipelago offer some of the most spectacular scuba diving in the world. These undisturbed and untouched dive sites are abundant with a variety of fish and corals, and offer a range of depths and reef topography to suit beginner and experienced divers alike. These dive sites offer a rare opportunity to discover an underwater world seen by just a few lucky divers each year. Our stunning house reef offers easy access straight from the main beach, and there are another 17 dive sites to visit inside and outside of the Quilalea Marine Sanctuary. Azura has a full range of high quality dive equipment. Our training pool on the bar deck is perfect for refreshing your diving skills or taking the plunge for the first time, and for training dives the house reef is ideal being just a few metres out from the beach. 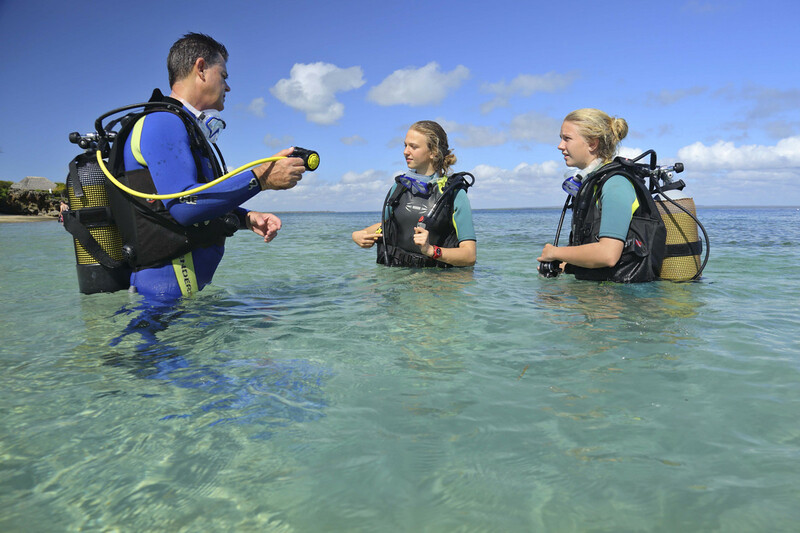 If you are interested in learning to dive and would like to try it out contact our dive instructor. We highly recommend that you complete the theory portion of your course at home, before your holiday. That way, you’re ready to start diving as soon as you arrive and will get to spend more time exploring the waters around the island. 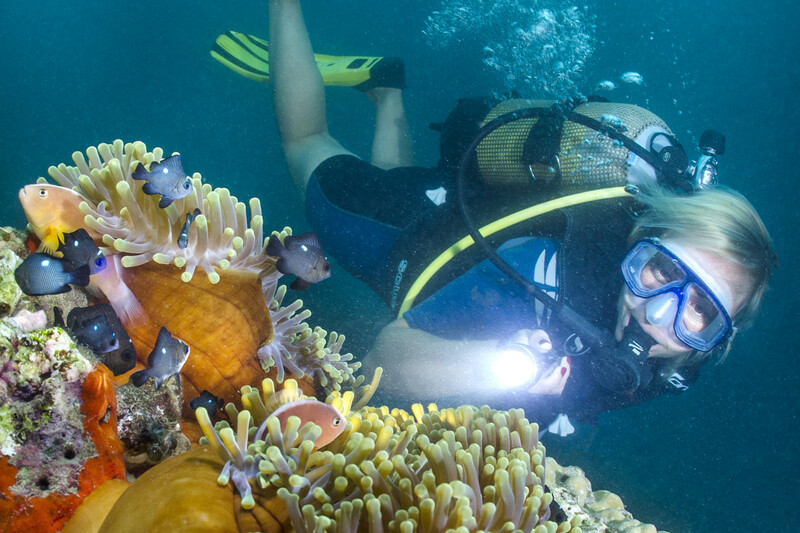 A PADI Discover Scuba course, which includes your first reef diving experience, can be completed in just a few hours. Children are welcome to learn to dive from the age of 10 upwards. 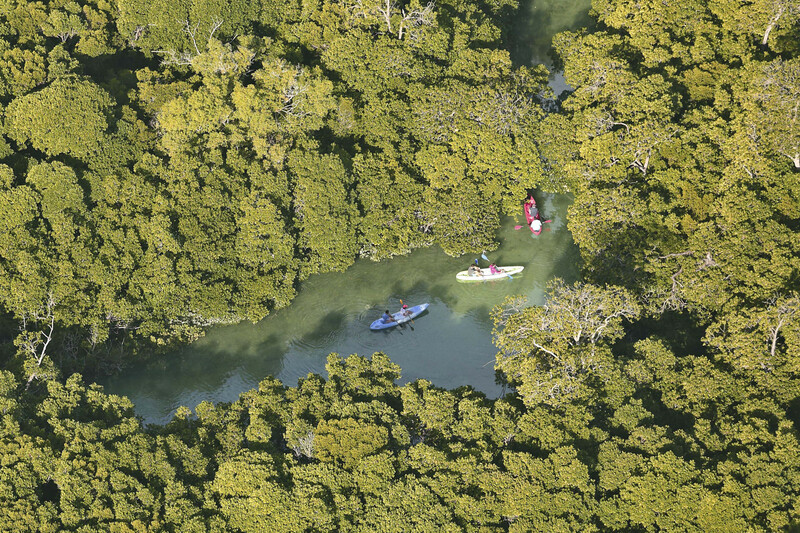 We will take you and the Kayaks by speedboat to the drop off point at which point we disassociate ourselves from the noise and power of the motorized boat and immerse ourselves in the sounds and sights of the beautiful mangroves that can only be accessed at high tide. Your guide will explain the uses of the mangroves whilst you look out for interesting birds, crabs and hermit crabs escaping from the rising water level by clinging on to the stems of the trees. Quirimba Island has a vast coconut plantation that is being run by the legendary Gesner family- a German family who have made the Island their home and have lived there since 1926! Visit the Island and go on a short tour of the plantation during which you will learn about the different stages of coconut production. You may also have the opportunity to see some of Quirimba’s colonial architectural ruins, visit and learn about the mangroves and relax on one of the pristine, uninhabited beaches. Your host will set up a private candle-light dinner on your deck or on the beach in front of your villa, surrounded by candles and lanterns arranged in the sand. 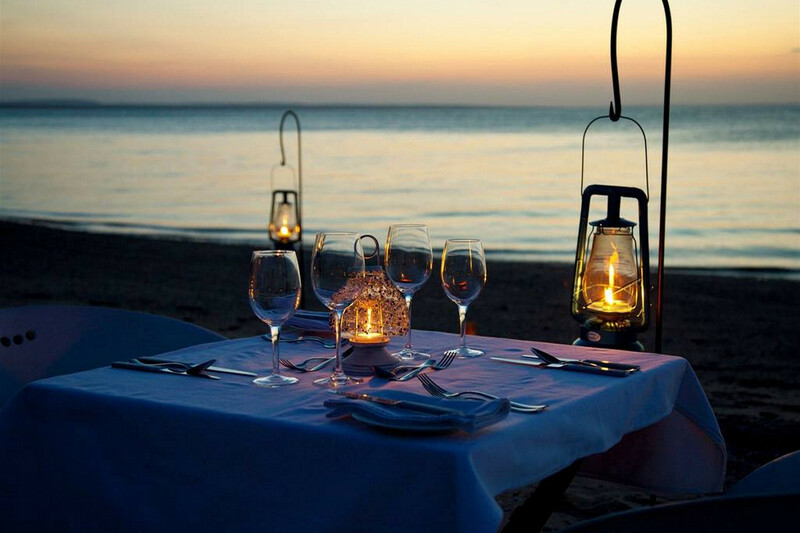 The ultimate in romantic dining! We always offer a choice of dishes, and our chef will happily try to accommodate any personal requests that you may have, although given the remoteness of our location, your understanding is appreciated if something you have a particular craving for is simply unobtainable.